Today was the family celebration of my birthday. It was wonderful. How weird is it going to be next year when I show up at work wearing my grandmother’s pearls? I may not be able to pull that off, but Sister Ann Wenita Morelove is certainly going to rock them with pride. 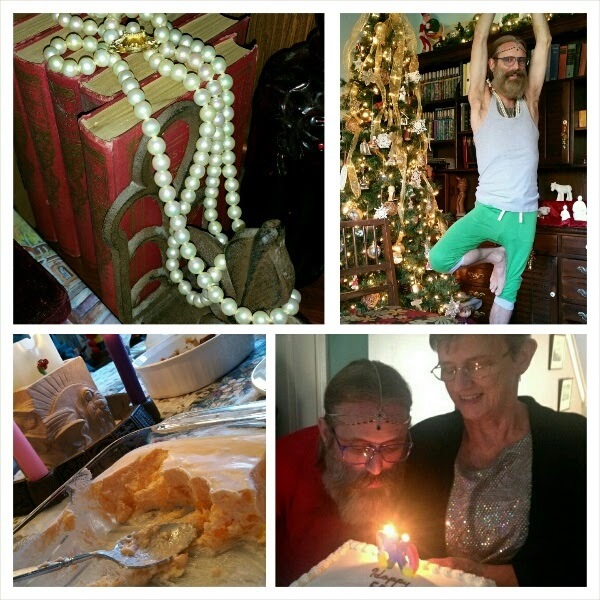 In addition to the pearls, I scored big with a yoga block and strap, bamboo yoga pants and shirt, a membership to a yoga website, fancy jello, and a Peanuts nativity. Ruth came through with hair jewelry. (Again, more for Sister Ann, but it really works well to keep my hair back. If I can get away with the pearls, perhaps the head jewelry is next). Can I just say how amazing it is to be at this point in my life? To be so completely known and to not only be accepted, but to be celebrated, is delightful. Yes, I have that. But I can’t say it without also knowing there are people who live without acceptance. As much as I’m grateful for those who accept and celebrate me (it was my birthday after all), it gives me joy to accept and celebrate others. I’m not always successful. Sometimes I’m judgmental, exclusionary, and just plain unaccepting. I want to work on that. I’ve always known it to be important, but it makes me sad to think it’s taken fifty years for me to realize it’s what’s most important. I grew up hearing that the most important law for living is to love God and love others. Today I heard that message again. My family taught me that law, and they showed it to me today. Tomorrow I will wake up on my birthday with a renewed commitment to live it.